For our data analysis below, we are going to expand on Example 2 about getting into graduate school. We have generated hypothetical data, which can be obtained from our website in R. Note that R requires forward slashes (/) not back slashes () when specifying a file location even if the file is on your hard drive. This data set has a binary response (outcome, dependent) variable called admit. There are three predictor variables: gre, gpa and rank. We will treat the variables gre and gpa as continuous. The variable rank takes on the values 1 through 4. Institutions with a rank of 1 have the highest prestige, while those with a rank of 4 have the lowest. Hotelling’s T2. The 0/1 outcome is turned into the grouping variable, and the former predictors are turned into outcome variables. This will produce an overall test of significance but will not give individual coefficients for each variable, and it is unclear the extent to which each “predictor” is adjusted for the impact of the other “predictors”. The code below estimates a probit regression model using the glm (generalized linear model) function. Since we stored our model output in the object “myprobit”, R will not print anything to the console. We can use the summary function to get a summary of the model and all the estimates. Next we see the deviance residuals, which are a measure of model fit. This part of output shows the distribution of the deviance residuals for individual cases used in the model. Below we discuss how to use summaries of the deviance statistic to asses model fit. The next part of the output shows the coefficients, their standard errors, the z-statistic (sometimes called a Wald z-statistic), and the associated p-values. 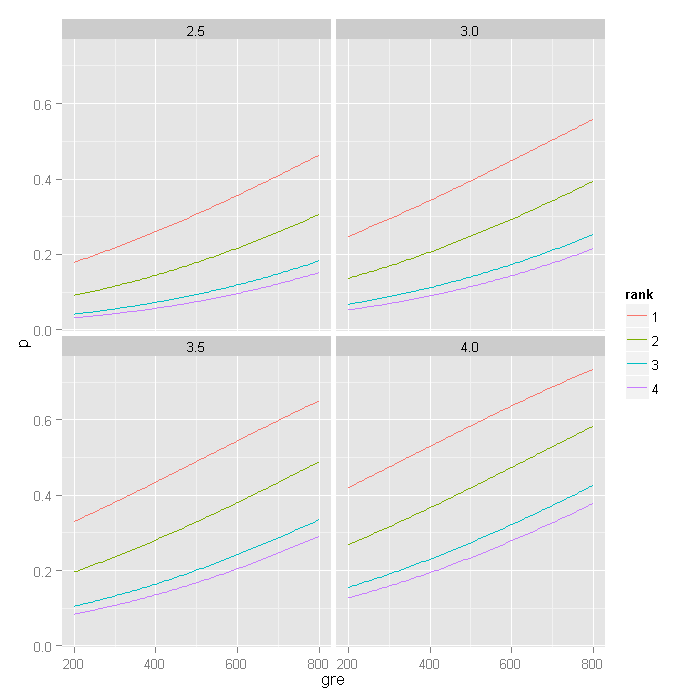 Both gre, gpa, and the three terms for rank are statistically significant. The probit regression coefficients give the change in the z-score or probit index for a one unit change in the predictor. We can use the confint function to obtain confidence intervals for the coefficient estimates. These will be profiled confidence intervals by default, created by profiling the likelihood function. As such, they are not necessarily symmetric. The chi-squared test statistic of 21.4 with three degrees of freedom is associated with a p-value of less than 0.001 indicating that the overall effect of rank is statistically significant. We can also test additional hypotheses about the differences in the coefficients for different levels of rank. Below we test that the coefficient for rank=2 is equal to the coefficient for rank=3. The first line of code below creates a vector l that defines the test we want to perform. In this case, we want to test the difference (subtraction) of the terms for rank=2 and rank=3 (i.e. the 4th and 5th terms in the model). To contrast these two terms, we multiply one of them by 1, and the other by -1. The other terms in the model are not involved in the test, so they are multiplied by 0. The second line of code below uses L=l to tell R that we wish to base the test on the vector l (rather than using the Terms option as we did above). You can also use predicted probabilities to help you understand the model. To do this, we first create a data frame containing the values we want for the independent variables. Now we can predict the probabilities for our input data as well as their standard errors. These are stored as new variable in the data frame with the original data, so we can plot the predicted probabilities for different gre scores. We create four plots, one for each level of gpa we used (2.5, 3, 3.5, 4) with the colour of the lines indicating the rank the predicted probabilities were for. We may also wish to see measures of how well our model fits. This can be particularly useful when comparing competing models. The output produced by summary(mylogit) included indices of fit (shown below the coefficients), including the null and deviance residuals and the AIC. One measure of model fit is the significance of the overall model. This test asks whether the model with predictors fits significantly better than a model with just an intercept (i.e. a null model). The test statistic is the difference between the residual deviance for the model with predictors and the null model. The test statistic is distributed chi-squared with degrees of freedom equal to the differences in degrees of freedom between the current and the null model (i.e. the number of predictor variables in the model). To find the difference in deviance for the two models (i.e. the test statistic) we can compute the change in deviance, and test it using a chi square test—the change in deviance distributed as chi square on the change in degrees of freedom. Sample size: Both probit and logit models require more cases than OLS regression because they use maximum likelihood estimation techniques. It is sometimes possible to estimate models for binary outcomes in datasets with only a small number of cases using exact logistic regression. It is also important to keep in mind that when the outcome is rare, even if the overall dataset is large, it can be difficult to estimate a probit model.